Not many fishing books can boast chapters called ‘Hanoi Jane Goes to Shooting School’ and get away with it. This is Randy White’s sixth book and he is just getting into his stride, calling on his experience as a fishing guide at Tarpon Bay Marina on Sanibel Island, Florida. The result is a real pot-pourri of stories, none of which could be described as a hard-core fishing tale, but all of which are entertaining, covering about as diverse a range of subjects as one would wish on a cold winter’s night. 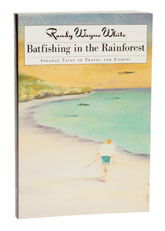 As for batfishing, you will have to wait until the very last pages to read about it, but the news is that central American fish-eating bats will take yellow poppers off the surface, even in heavy rain. Now there’s one problem we don’t have to contend with in the UK.